OK class, if the sudden movement won’t make you nauseous, let’s see a show of hands. What, in your estimation, is worse? The fact that the Pats were outplayed, outcoached and (gulp) outclassed in their brutal, 28-21 AFC Divisional Playoff loss on Sunday? Or that they were outplayed, outcoached and outclassed by (double gulp) the New York Jets? At the end of the day, it doesn’t really matter who it was that laid such a whipping on the Pats, regardless of how utterly odious the Jets are. The fact of the matter is, on the biggest stage, in their biggest game of this mostly magical season, the Pats strayed too too far from who and what they are as a team and what got them to that point on Sunday. That, combined with the Jets flawless game plan and execution, particularly on defense, spelled doom for the home team, ending what felt like a slam dunk of a Super Bowl season, three weeks too soon, with a most shocking thud. From our seats in section 201, we and those around us hardly recognized the team wearing the blue and silver uniforms. Following two early drives that began looking like typical Pats marches only to be ultimately stymied, one by a turnover and the other by a dropped TD pass, the Jets were emboldened and the Pats were flattened. From the end of their second, first quarter possession until near the midpoint of the third quarter, the Pats managed just 40 total yards of offense and while they wound up not only outgaining the Jets (372-314), running more plays (78-54) and holding the ball for longer (34:56-25:04), they never, ever looked comfortable doing any of it, never got in any kind of sustained rhythm and took four steps back for every step they took forward. So what really worked here? Not the running game, which accounted for 113 yards and four yards per carry but none that were particularly meaningful. And furthermore, on one of the game’s biggest plays, a third and-1 from near midfield on the Pats first possession of the second half, a give to BenJarvus Green-Ellis was snuffed out by everyone in the stadium and resulted in a one-yard loss and a punt (that this play came on the heels of a one-yard gain on second and-2 by Danny Woodhead made it even more painful to watch unfold). Not the passing game, which saw the Pats have their bread and butter – quick throws between the numbers to their tight ends (eight combined catches, 108 yards, woeful work in pass protection) and slot receivers – taken away from them to the point where Tom Brady was holding the ball for so long at times while waiting for someone to flash open that he looked like Drew Bledsoe. Wes Welker and Deion Branch were practically invisible, taken out by the Jets cornerbacking duo of the amazing Darrelle Revis and the not-amazing-but-good-enough-for-one-night Antonio Cromartie. Not the offensive line, the rock of the team, which gave up five sacks despite minimal blitzing by the Jets, was weak in the middle (hello, Dan Koppen) and featured a mind-boggling loss of composure by Logan Mankins, whose 15-yard personal foul penalty at the end of the first half signified perhaps more than any other play that the Pats had allowed the Jets into their heads. The Jets took away those intermediate, middle of the field throws through a multitude of disguised coverages and zone looks, basically daring the Pats to beat them with the running game and downfield passes. And the Pats couldn’t handle it. Brady was flummoxed for most of the evening, never quite catching up with what the Jets D offered to him. His numbers were decent (29-of-45, 299 yards, two TDs, one of them of the garbage time variety) and while he wasn’t aided at all by the multitude of drops, particularly Crumpler’s in the end zone and Deion Branch’s on 4th and-13 when the game was still winnable late, he couldn’t find a way to adjust except for when the Pats came out in their no-huddle late in the third (which they then shockingly, inexplicably went away from on their next possession). He wasn’t aided by the play-calling either, especially in the fourth quarter when they were down 10 points, ran a 14-play drive that netted just 48 yards, featured seven running plays and took up almost eight minutes while resulting in zero points. But that drive did result in something – it basically summed up the entire game in a nutshell. A lot of head-scratching, curious, hard-to-explain plays that ultimately led to nowhere. It started out so well for this group. After Brady’s first quarter INT, the defense stuffed the jets from inside the red zone, forced a field goal attempt and celebrated the subsequent miss. But after that, not a whole lot to cheer about. The Pats got exactly no pressure on Jets quarterback Mark Sanchez all night, not registering a single sack. And while that’s not terribly surprising given that they had no pass rush all year long and the Jets have an excellent, veteran offensive line, what was surprising was that they also didn’t force any turnovers, a crushing blow. For a team that has such a massively hard time getting off the field on third down, that has struggled so much all season to get stops, the inability to get any turnovers was a killer. The pass defense is so poor, so bereft of players who are any good in coverage with the exception of Devin McCourty (who the Jets pretty much stayed away from all night), that a guy like Sanchez, who managed just 55 percent completions and a 75.3 passer rating in the regular season, can wind up looking like, well… Tom Brady. While the real Brady was struggling to find open receivers all night, Sanchez, after a couple of early overthrows, lit it up, throwing three TD passes, posting a 127.3 passer rating and enjoying the time to do whatever he wanted in the pocket thanks to the Pats complete lack of a pass rush (in addition to the zero sacks, there wasn’t even a single hit recorded on Sanchez) . The killer, of course, was the TD pass to Braylon Edwards at the end of the second quarter following the Pats botched fake punt (more on that later), on which Edwards caught a hitch throw around the 10-yard line and proceeded to drag the eternally pathetic Brandon Meriweather seven yards into the end zone. But there was so much more that contributed to the Pats defensive demise. After some initial success, the depleted defensive line had a hard time containing the Jets ground attack. Battering ram Shonn Greene wound up with 76 yards on 17 carries (including a third quarter run on which he made it to the third level, saw Meriweather closing in and took advantage of Meriweather’s inability to tackle by lowering his head and shoulders and literally running over the Pats helpless safety, who then stood up and actually got in Greene’s face, humiliating himself for the umpteenth time this season) with the game-clinching TD run as the icing on the cake. And when the Pats grabbed the momentum back on the heels of their third quarter TD drive and two-point conversion run by Sammy Morris, it took the defense two whole plays to give it all right back when Sanchez flipped a little dump off over the middle to Jerricho Cotchery, who proceeded to run mostly unimpeded nearly 60 yards (with multiple missed tackles hardly holding him up), leading to a picture perfect TD pass and catch from Sanchez to Santonio Holmes in the corner of the end zone and another 10-point Jets lead. As with the offense, any time the defense was in position to grab or extend momentum, it couldn’t do it. Hopefully, thanks to the amount of picks the Pats have accumulated for the 2011 draft, they will either select an impact pass rusher or deal for or sign one in free agency. And maybe, they’ll be able to get another defensive back besides McCourty who can play (Patrick Chung has a ways to go despite his flashes of brilliance and James Sanders is a backup at this point while neither Kyle Arrington nor Darius Butler are NFL starting caliber). Jerod Mayo, Jermaine Cunningham, Rob Ninkovich and Brandon Spikes are all up and coming linebackers who the Pats should be able to count on to continue to improve. The game on Sunday should go down as a tremendous learning experience for all of these youngsters. Hey, you’ve gotta look for positives somewhere. How could this be? How could Bill Belichick, one of the greatest coaches of all time, show so poorly in such a big game? More than one player said in the aftermath that the Pats had a superb game plan, they just weren’t able to execute it. That may or may not be true (the lack of execution part certainly is). But one has to wonder how this one would have gone if the Pats hadn’t displayed the mentality of a team in panic mode on so many occasions when they hardly needed to. Brady’s INT came on a double reverse flea flicker that took about as long as the CBS pre-game show to develop. The play came on a first down from the Jets 28, was the second trick play of a seven play drive called and came after the first six plays of the possession yielded an average of over eight yards per play. Why? In the second quarter, with just over a minute left and trailing 7-3 on their own 38, they called for a fake punt, on which up man Chung fumbled the snap, instantly foiling the play. The Jets took over after a slight loss and scored a TD four plays later for a 14-3 lead they’d take into the half. Even if the play had worked, what in the world is the point of the call at that particular juncture? A punt there likely gives the Jets the ball around their own 20 with barely a minute left and the Pats on schedule to receive the second half kickoff down by four points. It’s likely that the call was made with the idea of giving the team a spark after a handful of flat series but from that spot on the field with that amount of time left in the half in a one possession game? Why? At the start of the fourth quarter, after just scoring their first TD and getting that two-pointer to cut the Jets lead to three and completely seize the momentum back, and with the ball on the Jets 29, the Pats played one of their deep zones designed to prevent a long pass play but give away a 20-25 yard swath of the middle of the field in the process even though the Jets had gone downfield maybe twice all night to that point against a QB who has been completely inaccurate on throws longer than 15 yards all season. Sanchez subsequently threw the quick slant to Cotchery, who naturally blew by his man (Butler) without being touched at the line of scrimmage, took the ball, found himself with no one within 30 yards of him and took off, not stopping until he was inside the Pats 20. Why? And why did they choose to follow up their successful use of the no-huddle from their previous possession upon getting the ball back after the Jets went back up by 10 to not only call so many running plays, but huddle up before each one and let the play clock burn away to low single numbers in the process? Why? Why did Belichick authorize such passive, conservative play-calling at such a crucial, urgent point of the game, especially after appearing so care-free about fakes and tricks in the first half? The answers to all of these questions is, I don’t know. I haven’t the slightest idea. I couldn’t possibly explain why a coaching staff so fixated on practicing situational football, so steeped in the motto of “do your job,” could or would so drastically change its MO in so many ways in such a big game. What worked so well for the Pats all year long didn’t work on Sunday at times because the Jets didn’t allow it but almost as many times because they didn’t allow it themselves. Sure, they’re young, especially on defense, but is that why Belichick somehow morphed into Andy Reid on Sunday? Did he completely forget not only what got his team to 14-2 and in possession of homefield advantage throughout the playoffs, but what earned him three Super Bowl rings and cemented the Pats reputation as the ultimate clutch, big-game team from 2001-2004 and at times beyond? Everybody has their bad days, even Belichick. He has most definitely lost playoff games before thanks in no small measure to being outcoached (Super Bowl XLII, anyone?). But for he and his staff to look so overmatched, so out of their element in such a major contest, at home, against a division rival they know as well as anyone is as big a mystery as any over the course of the past 11 seasons in Foxboro. Bill Belichick was outcoached by Rex Ryan. And then some. He and his staff and his team and his organization will have a long time, longer than most anyone around these parts and beyond expected, to try deciphering the answers to all those whys. They choked on Sunday. Who woulda thunk it? The thing that bugged me is that in the Patriots postmortem interviews, they said the Jets ran a ton of zone coverage. So, did they not practice for that during the two weeks leading up to this game? Has Tom Brady never faced zone coverage before? Sure looked like he never had before Sunday. I said at the beginning of the season that the game might be passing BB by. I still think he’s a great evaluator of talent and a great motivator but his in-game management in the post season over the last three years has been abysmal…and that used to be one of his great strengths. He never used to panic before or not make the proper adjustments. I don’t know if it’s age or hubris or what but it is troubling. Well, at least they have a bunch of high draft picks this year. I hope they draft a pass rusher (or two), O-line help and a RB…and maybe a S (to replace Merriwether who should be cut). I still say the single worst thing they did all day was to not stay no huddle in the second half. And I know Coach B isn’t much for saying “yeah, we should’ve done that”, he still stuck by the contention that he didn’t want to go no huddle. It’s crazy. 0-3 in the last 3 post season games really hurts. Ugh. 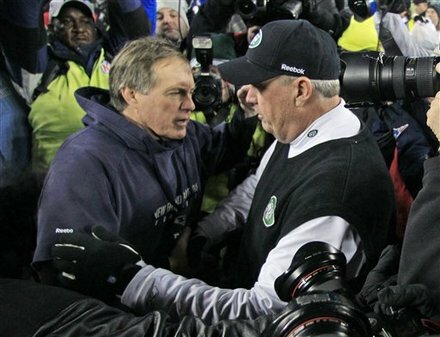 Time to re-examine Brady and Belichick’s playoff reputation. Since 2005, Brady has been average or below average vs. Denver, S.D (twice), Indy, NYG, Baltimore, and NYJ. His only good game was vs. Jax when he dinked and dunked his way to a win (which looks more of a reflection of Jax’s poor coaching now than anything). Belichick has now made some horrendous gameplans and coaching decisions since the superbowl 3 years running. He can no longer be viewed with such reverence as he used to be when he’s consistently being outcoached by different coaches every year in the biggest games of the year. 3. Use the rest of the draft picks on OLB’s, OL, and DE’s. The pass rush has been pathetic for 3 years.